Use these simple remedies for quick relief of nausea, nervous stomach, motion sickness, morning sickness and quell nausea of all types. The aromatic spices: cardamom, ginger, cinnamon and pimento are herbal all stars in relieving nausea, motion sickness, and morning sickness in pregnancy. Spearmint and peppermint are no slouches either, it really depends on what works best for you, there is a wide range of carminative herbs to choose from. You can quickly quell an upset stomach by sipping a cup of soothing herbal tea, using the essential oils in abdominal massage or simply taking a quick whiff of essential oil. 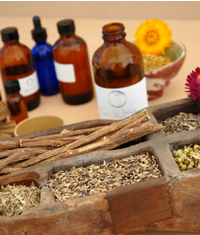 Many bitter herbs help prevent stomach upset from occurring in the first place by improving digestion and can be taken in small amounts before or after meals. Marlene Ericksen. "Healing with Aromatherapy" McGraw-Hill, (2000) Angelica's concentration of bitters make it an excellent digestive aid especially in cases of nervous stomach and tension-related digestive disorders.
. Prickly Ash Bark and Powder Profile , Mountain Rose Herbs, (2010): Chopped prickly ash bark can be used to make teas or tinctures when combined with: Ginger and/or Panax ginseng for relieving chronic abdominal pain. 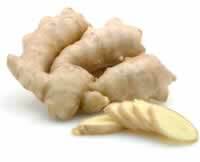 Ginger to treat nausea and vomiting in long-term illnesses. Mume fruit(plum blossom)and coptis, or Oregon grape root for treating symptoms caused by roundworms (usually vomiting).